SBisson raised the priority of this task from to Normal. SBisson added projects: Collaboration-Team-Archive-2015-2016, Notifications. SBisson moved this task from Untriaged to RFP (notifications) on the Collaboration-Team-Archive-2015-2016 board. SBisson added subscribers: SBisson, Aklapper. SBisson moved this task from RFP (notifications) to In Development on the Collaboration-Team-Archive-2015-2016 board. This is T52867: Add a way to thank page patrollers for reviewing a page I created, which requires T60485: [Epic] Allow thanks of log entry (which there may be other use cases for). But it would be some work (not a crazy amount, but not minor either), so reasonable not to do immediately. Thanks Matt. In the end, Stephane clarified that we can't do Thanks easily for pagetriage-mark-as-reviewed, but we can do it for pagetriage-add-maintenance-tag (because the tag creates and edit). So that's how we're going. I updated this change on the Notifications Spreadsheet. @Pginer-WMF Do you know where I can find the 'Thank' icon in png? There's one in the Thank extension but it's only ltr and has weird padding at the bottom. It doesn't look very good for a secondary link. @Pginer-WMF Do you know where I can find the 'Thank' icon in png? There's one in the Thank extension but it's only ltr and has weird padding at the bottom. It doesn't look very good for a secondary link. Above I just exported the existing one, which also has some padding around the image which I'm not sure how consistent that is with the rest. Let me know f we ned to adjust it in some way. So, let's not pursue the translation. That leaves the format issue. Format issue: There are a couple of suggestions for reformatting the style of this message. As we think about this, we'll want to consider whether we want to make the pagetriage-add-deletion-tag and pagetriage-add-maintenance-tag messages consistent. The page Moai was tagged with prod, afd, linkrot, and speedy deletion-vandalism. 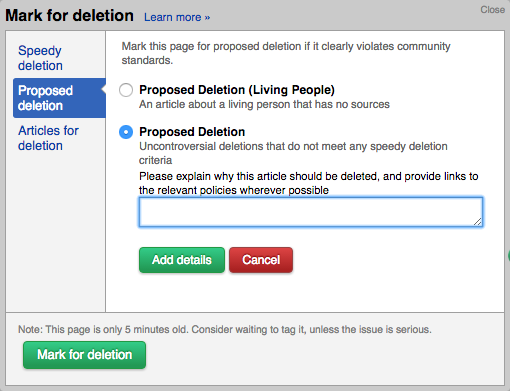 The page Moai was marked for deletion. Tags: prod, afd, linkrot, speedy deletion-vandalism. #2) Here is how they might look if we put the tags into the body for both messages. Tags: prod, afd, linkrot, speedy deletion-vandalism. The page Moai was marked for deletion. #3) And, I suppose we could put the tags into the body only for add-deletion but leave add-maintenance as is. I like #2 but I'm wondering if "for maintenance" is the right way to say it. It feels like oil change on a car whereas the situation here is more like: "Your article was not flagged for deletion, which is already a big achievement, but it needs improvements". I'm not suggesting this as the wording I'm just trying to illustrate the situation. The page Moai was reviewed and improvements suggested. A review of the page Moai suggested improvements. A reviewer suggested improvements to the page Moai. Or maybe we don't have to say "the page"? A reviewer suggested improvements to Moai. meant that the user was patrolling/monitoring a person, rather than a page. It could be split to only do this for user pages (and otherwise drop 'the page'), or there might be another way to address this. Also, some things have changed since then (e.g. re, "Why can't I click on the user names of the people who patrolled me to find out who they are? ", I think you now can). The page Moai has been reviewed. Still, for pagetriage-add-maintenance-tag, I don't mind putting "the page" back in if we think it makes this less controversial and possibly more clear. A reviewer suggested improvements to the page Moai. Tags: prod, afd, linkrot, speedy deletion-vandalism. I've updated the spreadsheet and cleared the question there about this. Speak up if you see a need to reopen. Stephane, the ball is back to you. SBisson added subscribers: StudiesWorld, Etonkovidova. Header text: The page Moai has been reviewed. Body text: Excerpt of the message. 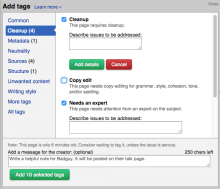 Header text: A reviewer suggested improvements to the page Moai. Tags: prod, afd, linkrot, speedy deletion-vandalism. Header text: The page Moai was marked for deletion. Tags: prod, afd, linkrot, speedy deletion-vandalism. Body text: Excerpt of the message. -- not displayed. 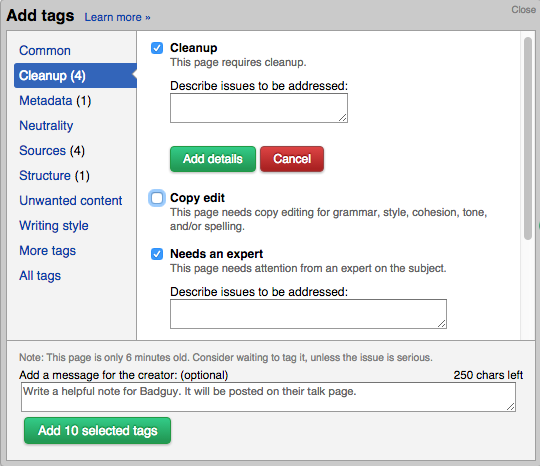 Notice that excerpt of the message for pagetriage-add-deletion-tag is not displayed. I misunderstood this from the start. There is no note for the marked for deletion notification. PageTriage accepts 2 different kinds of message. The first one is an explanation for a specific tag (not all but most tags accept it) that is being added to the page being reviewed in the template corresponding to the tag. The second one is a note to the user and is only available for the maintenance notification. @SBisson, Is there a reason why you are recommending we not include an excerpt from either of the notes you describe? They seem relevant. Or is there a technical difficulty? This information is not currently available to the notifications but we can fix that. In the case of maintenance, the message is clearly presented as a message to the user so it seems to make sense to include an excerpt in the notification. In the case of details added to tags, the text is supposed to be presented in the context of a template that explains the tag. I just don't know what kind of text is usually put there and how useful it is outside of its intended context. Sorry @SBisson, but I'm still not sure I understand your suggestion. What are you proposing? I completely understand your confusion. I was trying to explain (poorly) why I don't have enough information to propose anything. After looking at some examples ( look for "concern=" in the search results ), I think it could make sense to have that text in the notification. However, it would require modifying the front-end and API so it would take more time and testing. My inclination would be not to do it at this point but I don't feel strongly about it. ...it would require modifying the front-end and API so it would take more time and testing. My inclination would be not to do it at this point but I don't feel strongly about it. Thanks Stephane. My take is that anyone who wants to see the message can just click on the link. So I see no reason to pursue extraordinary measures. I think we should drop the requirement for message and will change the Notifications spreadsheet accordingly. 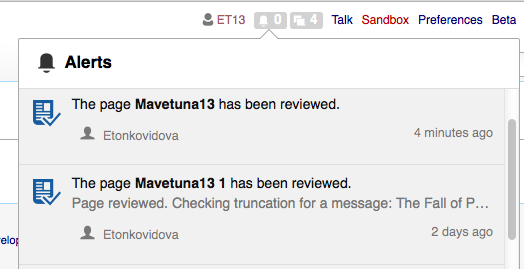 Just to confirm I have this right: I see the message excerpt in Elena's screenshots above for add-maintenance and mark-as-reviewed. So the circumstance for those types is different I presume? 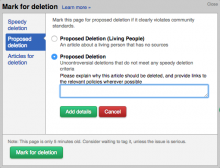 Ie., we're dropping the excerpt requirement only for add-deletion-tag, right? I want to close this ticket, but have to ask one question: the spec shows a "thank" link only for add-maintenance. Yet the use case for that would seem even better for mark-as-reviewed. Does anyone know why we didn't include "Thank" for mark-as-reviewed? It is not currently possible to do it with the Thanks extension. The only things we can target with Thanks are Flow posts or page revisions. Marking a page for maintenance creates a page revision that can be thanked. Marking a page as reviewed creates a log entry that cannot be thanked (yet). We are done here. Closing this. Thanks everyone. BTW, @Etonkovidova, your new notation style, with the breakdown and icons, is super helpful. Nice work!